Gallows Bound Debuts Video for “Sink in the Soil” & Announces North American Tour Dates With The Tossers! Home / Gallows Bound Debuts Video for “Sink in the Soil” & Announces North American Tour Dates With The Tossers! Winchester, Virginia’s Appalachian folk-punk/bluegrass outfit Gallows Bound recently completed work on a video for their latest single “Sink in the Soil” from their sophomore album self-titled “Gallows Bound” The video was directed and edited by Doug Stanford. Check the video out HERE. “We’re beyond excited to release our new video for “Sink in the Soil!” The video was shot on the banks of the Shenandoah River and tells the story about love, betrayal, and throw in a touch of crazy. 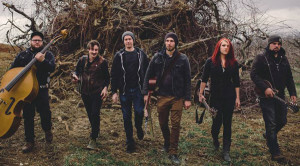 Enjoy, and catch us on the road,” says singer Jordan Joyes. Gallows Bound will be returning to the road heading out a short run of headline dates this August. This September they will team up with The Tossers for a string of dates in the US. Performing an aggressive yet melodic collection of songs ranging from fast and punchy tales of rambling and love, to dark and soulful songs birthed from whiskey and regret. A complete list of dates, including headline shows can be seen below. The new Album Gallows Bound is available in CD/Digital. Order your copy of Gallows Bound HERE. The digital iTunes version is available HERE. The album was recorded with Doug Stanford at The Red Room Studios in Winchester, VA. Gallows Bound is direct result of the relentless work the band put in the past 18 months grinding it out on the road touring non-stop with the likes of Hackensaw Boys, Mischief Brew, Koffin Kats, Supersuckers, Jayke Orvis, Stellar Corpses, Daycare Swindlers, Filthy Still and more. Gallows Bound can be streamed in full on Gallows Bound’s bandcamp page.